On one side, there’s the organic produce: smaller, possibly misshapen, and more expensive. On the other side, there are bountiful baskets of non-organic produce that look pretty tempting — especially when they’re on sale. But will all the health benefits still register if you choose non-organic? Or are you subjecting yourself and your family to deadly invisible pesticides in an effort to save a buck? The answer is it depends. The Environmental Working Group releases a list each year of fruits and veggies you should always buy organic. Those are known as “The Dirty Dozen,” thanks to their high likelihood of exposure to and absorption of pesticides. On the other end of the spectrum, the group recommends if you’re going to choose non-organic, you should look at “The Clean 15.” These fruits and vegetables might contain trace amounts of pesticides, but overall they’re not very harmful and worth buying non-organic. So save your cash, and read on for the 15 fruits and vegetables you don’t really need to buy organic. Good news: Your beloved corn on the cob is safe, thanks in part to that thick protective husk you spend so much time shucking. In fact, corn was the cleanest of the clean, with less than 1% of all tested samples showing any trace of pesticides, according to the Environmental Working Group. Take heed, though, that most corn is grown with controversial GMO seeds. So buy organic if that’s something you’re trying to avoid. Get the Latest Smartphones & Plans for One Low Monthly Price. Shop Today & Save! Soft on the inside and tough on the outside, avocados are like the snail of the fruit world. That thick skin helps to protect them from pesticide exposure, and it makes them one of the least contaminated items on this list. The Environmental Working Group found less than 1% of all avocados contained pesticides. So your trendy avocado toast can safely be served up without paying organic prices. That thick and prickly skin is great for warding off pesticides. Consequently, the sweet pineapple fruit ended up third on the Clean 15 list. In fact, more than 80% of pineapples tested had no pesticide residue whatsoever. Although it might not be the most popular vegetable on the list, the stoic cabbage gets a nod thanks to its thick outer leaves, which protect the inside from pesticide exposure. To decrease your risk of pesticide exposure even more, peel off the outermost layers before enjoying. Don’t cry — onions are safe. The same tangy, bitter texture of a raw onion that keeps humans from consuming them raw (except when doused in salad dressing) is what keeps pests away. That negates the need for pesticides. Frozen vegetables in general contain fewer pesticides than their raw counterparts, thanks to the blanching process they undergo prior to freezing. So go ahead and get the non-organic sweet peas. Peeling away the thick outer skin of a papaya decreases your risk of pesticide contamination. And that’s a good thing because papayas are sweet and delicious. And they’re packed with antioxidants, vitamin A, and fiber. The bitter taste of raw asparagus makes it less attractive to pests, and therefore it’s less likely to need any kind of pesticide protection. Plus, asparagus contains several nutrients, such as folic acid, potassium, and fiber. And it has powerful antioxidants. This sweet, tropical fruit is chock full of antioxidants and has even been linked to lower cholesterol, clearer skin, and improved digestion. It also makes the list of clean fruits because of a thick shell, which might be a little complicated — but not impossible — to peel. It’s well worth the effort. This noble purple-hued vegetable has a very unique and versatile taste, lending itself well to vegetarian dishes, such as eggplant Parmesan. Or it can be roasted or even eaten raw. Another nice thing about eggplant? Even when non-organically grown, it’s resistant to pesticides, thanks to a thick outer skin. Like other melons, the honeydew is protected from pesky pesticides because of a thick outer rind. And like every other item on this list, it tested positive for no more than four different kinds of pesticides. Deceptively fuzzy on the outside, kiwis offer a sweet treat that’s always a welcome addition to your fruit salad. Best of all, kiwis contain little to no pesticides, again thanks to a tough outer skin. You can enjoy non-organic cantaloupes without fear of ingesting pesticides. The thick rind of this popular fruit acts as a suit of armor, protecting the inside from possible contamination. This cruciferous vegetable is classified as a superfood and has been linked to positive health benefits, including fighting certain kinds of cancer and boosting heart health. So being relatively free of pesticides is only the start of its health benefits. 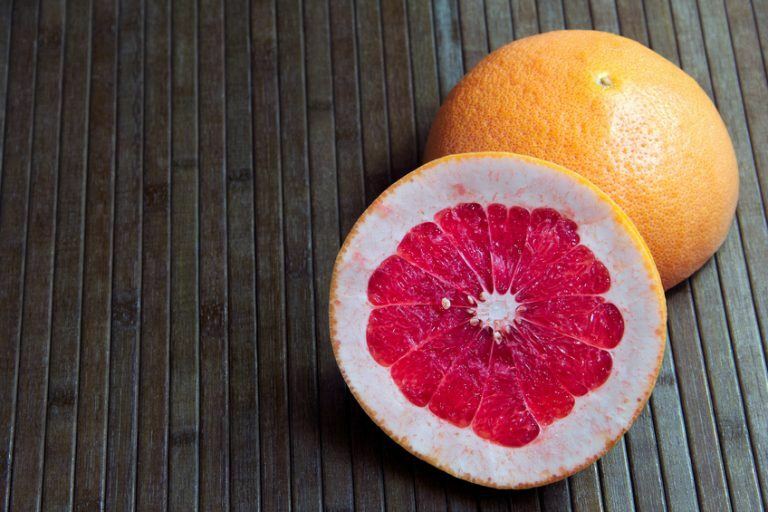 Following the trend of other thick-skinned fruits, grapefruits get their protection from a thick peel that protects the fruit hidden within. This low-calorie, tangy treat can even help lower your cholesterol, curb your appetite, and clear your skin.